In this Photoshop Effects tutorial, we're going to learn how to take an ordinary photo and give it more focus and impact by creating a light source and shining it on the main subject through a window. 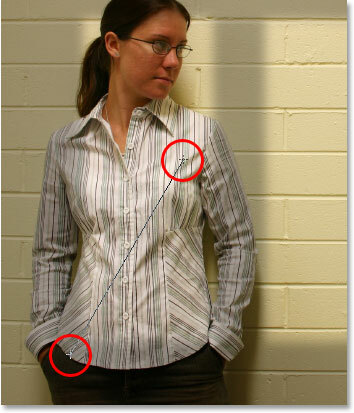 You'll need the photo you want to add the lighting effect to, as well as a photo of the window you want to use. 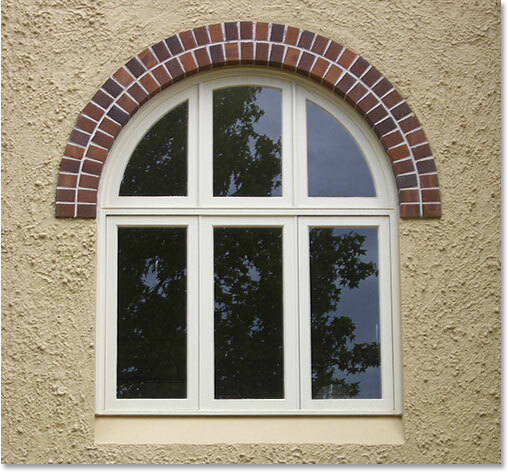 If you don't have a photo of a window, just do a quick search on the internet for one, since it's really just the shape of the window we'll be using, not the window itself. To create the lighting effect, we'll be using a Levels adjustment layer, along with its layer mask, and we'll see how we can use a layer blend mode at the end to enhance the light even further. It may sound complicated, but it's really very easy. The great thing about this effect is that there's lots of room for creativity, since there's no need to limit yourself to using only windows as the object the light is shining through. With a little imagination, you can shine light through any shape you can think of for some truly interesting and unique results! Photoshop Lighting Effects: The final result. Open both of your photos in Photoshop. 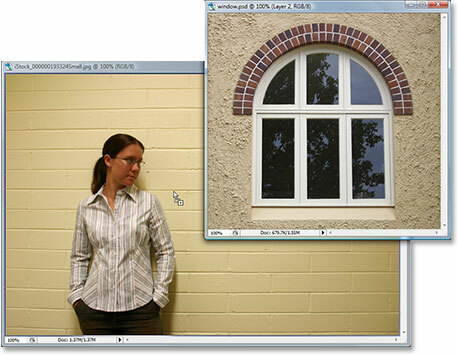 Drag the window photo into the main photo's document window with the Move Tool. 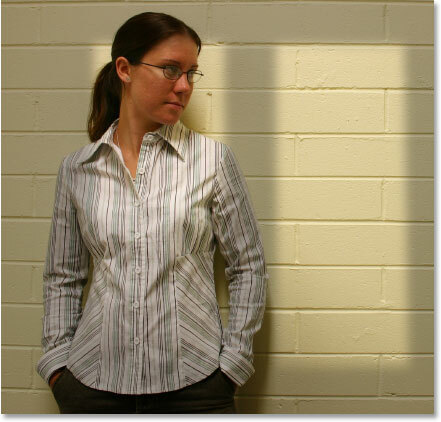 The window now appears inside the main image. 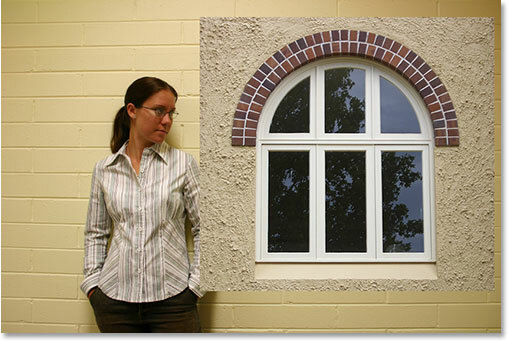 Now that our window photo is inside our main image, we need to make a selection around the inside of the window. Depending on the window you're using, the Rectangular Marquee Tool or the Elliptical Marquee Tool may be all you need to select it. Be sure to check out our tutorial on the Full Power Of Basic Selections if you need help with adding to, subtracting from, or intersecting with selections. 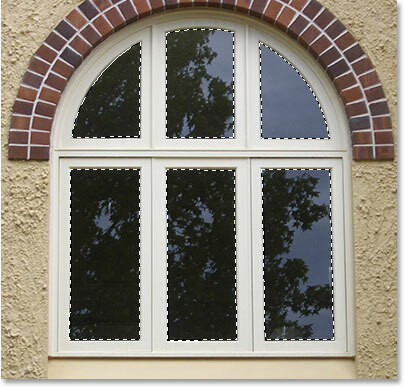 Use the selection tool of your choice to select around the inside(s) of the window. Delete "Layer 1" by clicking on its layer and dragging it down onto the Trash Bin icon at the bottom of the Layers palette. The selection we made around the window remains inside the image. We're going to use a Levels adjustment layer in a moment to darken the image everywhere except in the area that was inside the window, which is going to give us our "light shining from a window" effect. To do that though, we need to have everything except the area that was inside the window selected, but at the moment, we have the exact opposite. We have the area that was inside the window selected, while the rest of the image is not selected. To fix that, we need to invert our selection, which basically means we need to swap the selection around so that what's currently selected becomes deselected, and what is currently not selected becomes selected. To do that, all we need to do is go up to the Select menu at the top of the screen and choose Inverse, or we can use the keyboard shortcut Shift+Ctrl+I (Win) / Shift+Command+I (Mac). 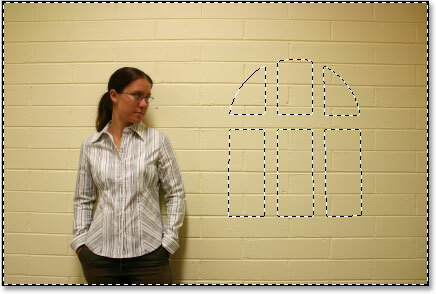 Invert the selection so that everything except the area inside the window shape becomes selected. Clicking the "New Adjustment Layer" icon at the bottom of the Layers palette. Choose a "Levels" adjustment layer from the list. This will bring up the Levels dialog box, and we're going to use it to darken our image and create our lighting effect next. With everything except the area that was inside the window selected, we can now darken the image and create our lighting effect quite easily using the Levels adjustment layer. If you look at the bottom of the Levels dialog box, you'll see a horizontal bar with a gradient going from black on the left to white on the right, with a small black slider below it on the far left and a small white slider below it on the far right. These sliders are the Output Levels sliders. The name is a bit confusing, but what these sliders do is determine how bright or dark the image can be. If you don't touch the sliders at all (normally you just leave these sliders alone), the image can be displayed with a full tonal range. In other words, it can display everything from pure black to pure white and everything in between. Normally, this is what you want. Sometimes though, like when you're creating an effect as we're doing here, you want to limit how bright or dark the image can be. In our case, we want to darken the image, and the easiest way to do that is to simply limit how bright it can be by clicking on the white output levels slider on the far right and dragging it towards the left. As you drag, you'll see the image becoming darker and darker, and that's because we're limiting how bright it can be. 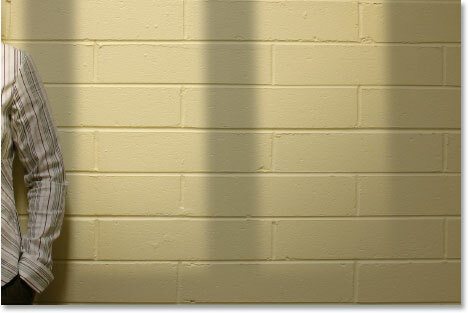 The only part of the image that will not be affected by the slider, and therefore not become darker, is the area that was inside the window which is the only part of the image that is not currently selected. It will remain at its original brightness level, giving our us lighting effect. Drag the white output levels slider towards the left to darken the image everywhere except for the area that was inside the window. The light shining from a window appears as you drag the white point slider to darken the image. It's completely up to you how dark you want to make the image, so drag the slider until you're happy with the results, then click OK to exit out of the Levels dialog box. Hold down "Ctrl" (Win) / "Command" (Mac) and click directly on the layer mask thumbnail for the Levels adjustment layer to reload the selection. 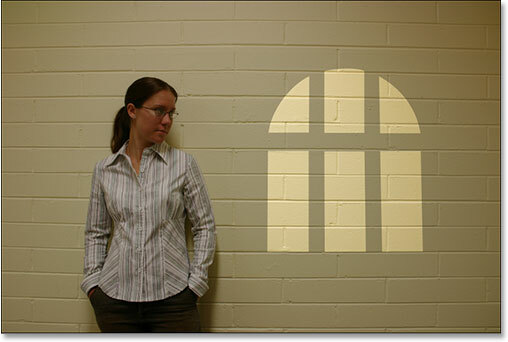 Invert the selection once again so that only the area around the window light is selected. 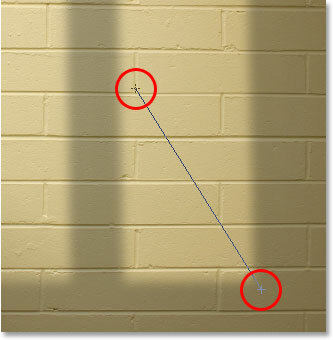 Move the window lighting into position and resize it as needed with Free Transform. Press Enter (Win) / Return (Mac) when you're done to accept the transformation, then press Ctrl+D (Win) / Command+D (Mac) to deselect the selection. The only problem with our window lighting effect at the moment is that the edges are too sharp, which looks unrealistic. Let's soften them by applying the Gaussian Blur filter. To do that, go up to the Filter menu at the top of the screen, choose Blur, and then choose Gaussian Blur. I'm going to set my Radius value to about 5 pixels to soften my edges. If you're using a high resolution image, you'll probably want to set yours a bit higher. Soften the edges of the window light with the Gaussian Blur filter. The image after softening the window light edges with the Gaussian Blur filter. Photoshop's Foreground and Background color swatches in the Tools palette. "Right-click" (Win) / "Control-click" (Mac) anywhere inside the image and select the "Foreground to Background" gradient from the Gradient Picker. 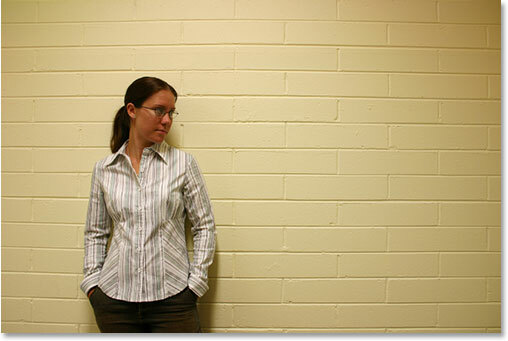 Drag a short white-to-black gradient from the bottom left corner of the window light in towards its center. The window light now gradually fades away in the bottom left corner. Drag a short white-to-black gradient from the bottom right corner of the window light in towards its center. The light now appears to fade away in the bottom right corner just as it does in the bottom left corner. To finish off the effect, I'm going to make the window light a bit more intense, and I'll do that next. We're going to finish off the effect by making the light shining from the window a little more intense. Again, this is an optional step, but it's very simple. Hold down "Ctrl" (Win) / "Command" (Mac) and click on the layer mask thumbnail in the Layers palette. The selection loaded in the image. Everything except the window light is currently selected. Invert the selection so only the window light is selected. The rest of the image becomes deselected. Add a second Levels adjustment layer. 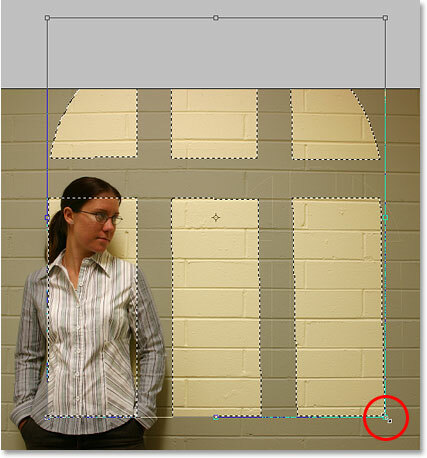 Photoshop's Layers palette showing the second Levels adjustment layer at the top, above the original. Step 18: Change The Blend Mode Of The Adjustment Layer To "Screen"
Change the blend mode of the second Levels adjustment layer from "Normal" to "Screen". The light appears much more intense after changing the blend mode to "Screen". 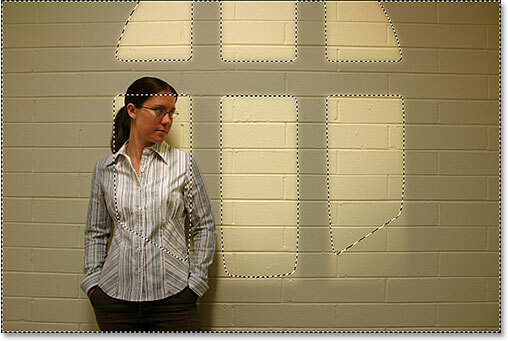 Reduce and fine-tune the intensity of the light by lowering the opacity of the Levels adjustment layer. And there we have it! That's how to create a window light effect with an image in Photoshop! Visit our Photo Effects section for more Photoshop effects tutorials!